FORMER Pres. Bill Clinton says delegate-rich Texas is a must-win for his wife New York Sen. Hillary Clinton‘s Democratic nomination fight against Illinois Sen. Barack Obama. THERE’s a Texas-sized stumbling block on Sen. Hillary Rodham Clinton‘s comeback trail. Even Clinton’s most devoted surrogate – her husband, Bill Clinton – acknowledged the do-or-die stakes on Wednesday in Beaumont, Texas, conceding that a loss in Texas or Ohio would likely doom her candidacy. “If she wins Texas and Ohio I think she will be the nominee. If you don’t deliver for her, I don’t think she can be. It’s all on you,” the former president told the audience at the beginning of his speech. A series of demographic and organizational challenges are coming together to make the Lone Star State an extraordinarily difficult venue for Clinton, with her campaign needing a decisive win to overcome Sen. Barack Obama‘s growing edge in convention delegates. With polls showing the race essentially tied, several independent political analysts say that even if Clinton takes an overwhelming share of Latino voters, she will be hard-pressed to carry the state, much less capture a large share of delegates. And the unique way that Texas awards delegates could force Clinton to take as much as 55 percent of the state’s vote just to break even in the battle for delegates, said Richard Murray, director of the University of Houston’s Center for Public Policy. Texas is the biggest prize remaining on the Democrats’ schedule. It’s a virtual must-win for Clinton, D-N.Y., who has dropped 10 contests in a row to Obama, D-Ill.
March 4 voting in the Texas primary – which will allocate 193 convention delegates – provides Clinton’s best opportunity to jump back into the race, with the state’s large Hispanic population providing an apparent edge to Clinton. But a few significant quirks could frustrate the Clinton campaign. For starters, Texas has a one-of-a-kind primary/caucus system, where two-thirds of the state’s delegates will be awarded in the March 4 primary, while the remaining third will depend on the results of caucuses later that evening. Voters are permitted – and, in fact, are encouraged by campaigns – to attend both events. But Obama has demonstrated organizational strength in other caucus states, leaving him favored to emerge with the larger share of the 67 delegates at stake in the caucuses, regardless of what happens in the primary earlier in the day. Another factor in Obama’s favor is the open nature of the primary. 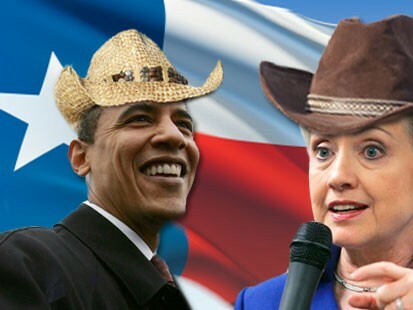 Texas – like Ohio, the other big state that votes March 4 – allows independents to vote in the Democratic primary, a dynamic that has significantly favored Obama in other states, including Wisconsin, which voted on Tuesday. In addition, Texas Democrats have designed a system of delegate allocation that rewards parts of the state that have voted heavily Democratic in previous elections. This means that many of the areas the Clinton campaign is most heavily targeting – particularly the Latino-heavy communities in the Rio Grande Valley – carry less weight than some of the urban areas that favor Obama. For instance, voters in three urban state senate districts – overwhelmingly black districts in Dallas and Houston, and a white liberal enclave of Austin – will choose 21 convention delegates between them. But because of low Latino turnout for Democrats in the 2004 and 2006 elections, some state senate districts choose as few as two delegates each. Texas’ odd system of allocating delegates has flummoxed the Clinton campaign. Clinton told reporters over the weekend that her aides were still struggling to understand how the state operates. Asked by ABC News how the Clinton campaign would define success in Texas, Clinton communications director Howard Wolfson said he wasn’t sure. “I think all of you will be looking at a lot of different data points to determine who wins the night,” Wolfson said. A CNN poll released this week had the race statistically tied, with Clinton up 50-48 over Obama. Clinton is focusing her efforts on Texas‘ Hispanic communities. She reminds crowds of her work in South Texas on behalf of George McGovern‘s 1972 presidential campaign, and she’s pumping resources into the Democratic-leaning counties that line the border with Mexico, and setting up field offices in Hispanic neighborhoods in the big cities. “The Latino voter, from Dallas all the way to the Rio Grande Valley, they’ve heard they’re going to be the difference, and they’re going to show up for her,” said Marc Campos, a veteran Houston-based Latino Democratic consultant who is not aligned in the presidential race. Independent observers expect Latinos to comprise roughly one-third of Democratic primary voters – though the Clinton campaign hopes to nudge that figure above 40 percent. Exit poll data from 2004 suggests that the Latino population is roughly similar in socioeconomic status to Latino voters in other Southern and Western states, with more than 70 percent lacking college degrees and a similar portion earning less than $50,000 a year. If Texas Latinos vote as they have in other states, Clinton could expect to receive about two-thirds of the Latino vote. But that edge could be essentially nullified by the African-American vote, which is expected to make up one-fourth of the primary vote, and is energized on behalf of Obama. In other states, black voters have been favoring Obama by as much as 80 and 90 percent. That leaves the battleground to the state’s white voters, a diverse group that could represent as much as 40 percent of the voters on March 4. White independents have favored Obama in other states, though their support is unlikely to be monolithic for any one candidate in Texas, said Linda Curtis, founder and director of Independent Texans, an advocacy group that represents independent voters. She noted that many of the state’s independent voters are conservative by inclination, and could support home-state candidate Rep. Ron Paul, R-Texas, or former governor Mike Huckabee, R-Ark., who has made a broad populist appeal to voters. White Democrats in Texas are a fast-changing demographic group that look less like traditional Southern white voters every year, Frost said. Younger white voters tend to be more liberal and clustered around the urban areas of Dallas, Houston, Austin, and San Antonio – and could support Obama, who has grown stronger among white voters as the campaign has progressed.